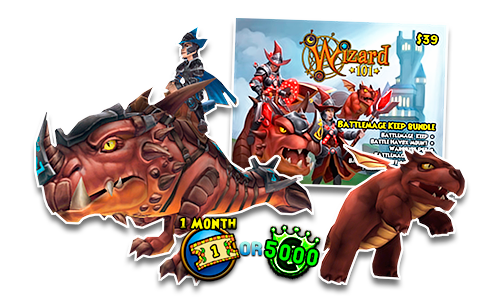 A brand new Wizard101 game card is available in stores now: the Battlemage Keep Bundle! You'll find this all new game card at GameStop stores across the United States, for $39. The Battlemage Keep is the tallest castle in the Spiral, with a PvP Arena at the top of the highest tower! Lost in the skies of the Spiral, this magic house has plenty of space for you to develop your decorating skills, housing games and parties. You'll also find a Cauldron in a hidden secret passage, offering daily rewards! The Battle Havox is a fearsome, dyable mount that'll grant a 40% speed boost to your Wizard, and an additional 2% universal damage boost! The Wargoyle Pet is ready to join you on your magical adventures, giving your Wizard a "Vengeance" card at Baby, with a starting pedigree of 73 and the Vehement Vanquisher talent, which may cast "Conviction". 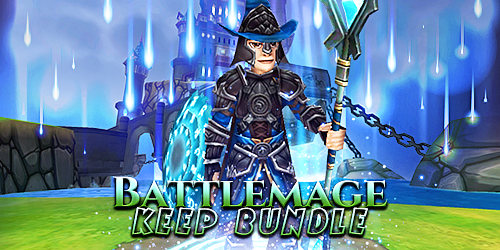 The Battlemage Armor goes up to Level 120 and gives great overall stats to your Wizard. The Battlemage Staff & Shield grants your Wizard 70 critical rating, 70 block rating, 10% universal damage, 1 power pip, 205 pip conversion rating, a Square jewel socket and Maycast 'Quicken' and 'Impede' at Level 120+, and includes different color variations for each school that you can stitch.